Are you a coach wanting to build a coaching business or a professional considering making a change and developing a coaching business? For many coaches today the challenge is not only in being a great coach, but also in creating and running a sustainable business. 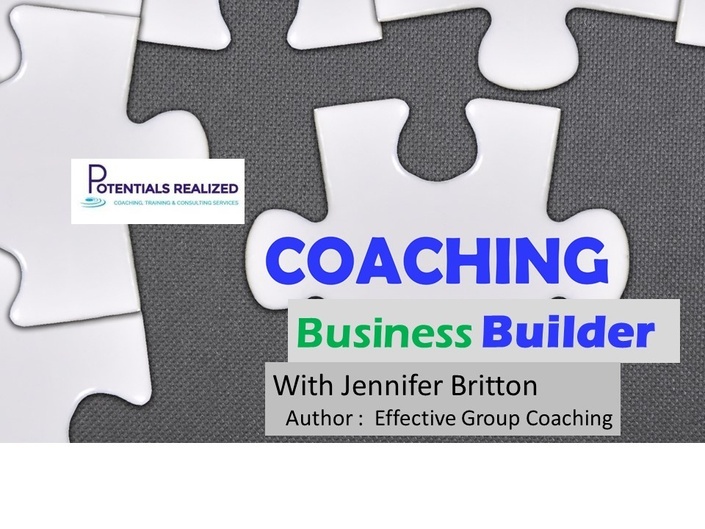 Join Effective Group Coaching author Jennifer Britton for the Coaching Business Builder: 12 Tips for your Coaching Business. Since 2004, she has supported thousands of coaches through her programs, writing and coaching, to create powerful group and team coaching processes and programs. Many of these have become the foundation for thriving coaching businesses. In the Coaching Business Builder here at the Learning Lab and Design Studio™ from Potentials Realized, Jennifer puts on her former business advisor hat, to bring you the Coaching Business Builder Foundation program. She has distilled content in 12 areas you will want to explore further as you build, and refine, the foundation of your coaching business. For those interested in going deeper into these topics, consider joining Jennifer for some individual coaching work or joining one of her coaching groups including membership in the Learning Lab and Design Studio Coaching Gym. Are you able to work with me individually through one-on-one coaching? Can I join a coaching group? If you would like individual coaching support select the individual coaching support which includes 2 hours of individual coaching support. If you prefer to connect with others in a group, quarterly group coaching calls offered for this program two Fridays each month from 2 - 245 pm from November 2015 - March 2016. Hours in the "Coaching Gym" vary by season. During these calls Jennifer is available to coach you, or answer questions you have. .
Access the Coaching Business Builder program 24/7. The program includes several hours of video tips, along with twelve worksheets. Ready to grow your coaching business? If you want more hours after this two hour block they can be purchased in a series of 2, 5 or 10 hour packages. Have full access to the Coaching Business Builder Course, and join Jennifer in the Coaching Business Builder Group Coaching Lab twice a month on Fridays. You can use the group call to get your questions answered, or get some laser coaching. You will also connect with others who are building their coaching businesses. She'll also make available worksheets and/or business building resources for each call. Can't make every Friday session? Not to worry, calls are recorded and shared with the group. Have full access to the Coaching Business Builder Course, and join Jennifer in the Coaching Business Builder Group Coaching Lab twice a month on Fridays. This package covers six months in the coaching gym at a discounted rate - you save $500 off the regular $250/month, or get 2 of the 6 months free! You can use the group calls to get your questions answered, or get some laser coaching. You will also connect with others who are building their coaching businesses. We also make available worksheets and/or business building resources for each call. Can't make every Friday session? Not to worry, calls are recorded and shared with the group. Group members also connect offline between sessions with a private online group.